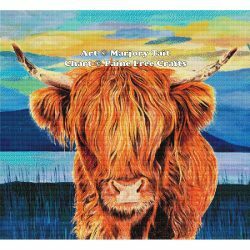 Marjory Tait is the talented artist behind Highland Celtic Art . 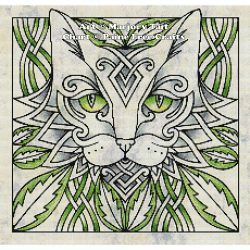 Based in Scotland, she's very much an artist inspired by local flora and fauna, and celtic art. Bringing a more modern feel to traditional pieces, her art transfers beautifully to the stitching medium. 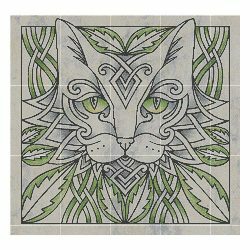 Living on the family croft above Loch Ness, I spend much of my time in nature, observing plants and animals in their natural habitat.I do really enjoy drawing and using different media, but producing modern Celtic Designs appeals to my creative nature. 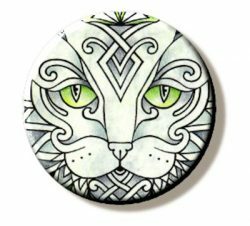 This fabulous range of Needleminders created under licence from art by Marjory Tait (Highland Celtic Art) are now available.They are a magnetic needleholder so you don't lose your needles (and the magnet is handy for finding them if you accidentally drop a needle! 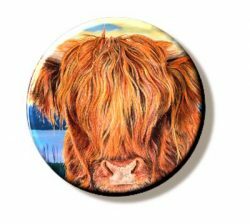 )They can be also used to hold patterns, pins, or simply be used as fridge magnets.These needleminders are 38mm in diameter, and have strong magnets, so please do NOT use them near sensitive electronic equipment.Please note that due to the nature of the manufacturing process, the products are not always identical (they're not manufactured in bulk by machines!) and may vary by a couple of mm but we'll always make sure we do our best to make them look stunning!